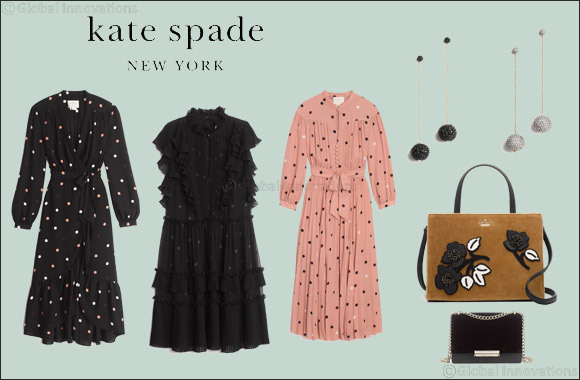 Dubai, UAE, October 23, 2018: Shot by Inez and Vinoodh - who have shot all Kate Spade New York campaigns for 2018- and styled by Laura Ferrara, the Holiday 2018 campaign concludes the brand's year of celebrations in honor of its 25th anniversary. Margaret Qualley – always feminine, optimistic and in love with life - is ready to celebrate the holiday season…albeit with a few unexpected surprises on the way to the party. With our original Sam bag by her side, Margaret closes her year as the leading lady of our story. This time, the iconic Sam bag is featured in a party-ready pale pink satin with a contrasting label fixed to the outside of the bag, as a nod to the original design from 1993. The campaign images focus on the brand's iconic handbag silhouette, pictured in a pop of color juxtaposed against black and white shots. The Holiday 2018 campaign features still images and video content for web and social media shot on location in NYC.